Don’t miss this FREE SHOW during “No Cover November” with The Magic Beans, who have graciously stepped up to replace the last minute cancellation of Organ Freeman THIS SATURDAY! The Magic Beans are a band sprouted from the cultural island of Colorado that are set out to bring their unique, genre-blending music to the masses and inspire good times. In the modern age, where things are no longer quite as black and white; the Beans strive to be as inclusive as possible by skirting the lines between many genres within their unique sound. Music can encompass so many different feels and emotions and it is the bands goal to incorporate as much of it as they can into their sound and sometimes even one composition. Listeners are left with a danceable ode to funk, rock, bluegrass, americana, livetronica, world, prog, and more. Fans have effectively dubbed the genres they hear as spacefunk, ameritronica, and groovegrass. Todays modern music listener no longer defines themselves within one genre, in favor of enjoying as much diversity as they can. It is upon this new musical paradigm of inclusivity that the Beans have grown one of the largest fanbases in their region, the self-named Team Bean. 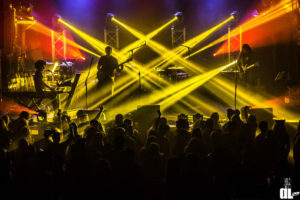 The group uses no pre-recorded tracks or samples in favor of a more traditional approach to music; original songwriting and continually pushing the envelope are what have set this group apart. Seamlessly combining traditional genres with modern dance music, The Magic Beans strive to be original and expressive of the modern music lover. The Magic Beans have shared the stage with an eclectic group of musicians: ranging from String Cheese Incident, Umphrey’s McGee, Lotus, Disco Biscuits, Leftover Salmon, ALO, The Motet, to acts like Railroad Earth, Kyle Hollingsworth Band, Great American Taxi, Twiddle, Dopapod, Zac Deputy, Elephant Revival, Greensky Bluegrass, Split Lip Rayfield, Juno What, Papadosio, & The Werks just to name a few. They’ve performed over 400 shows as group across the nation, selling out venues as they go. They host the annual Beanstalk Music Festival in Colorado which sells out every year and plays host to international, national, and regional acts of all kinds.